One way to enter my work is through the drawing. A simple tool like a pen is usually what activates an idea. With a pen, I can navigate the overflow of information, of calm or erupting emotions, confusion, understandings and misunderstandings. The fragments the pen delivers from the mind´s eye via the hand onto a surface, as lines gather together into a universe of their own. It is an abstract place made of fragmented thoughts. When the drawing works itself into a 2D painting, color and brush add more information and expand the universe. 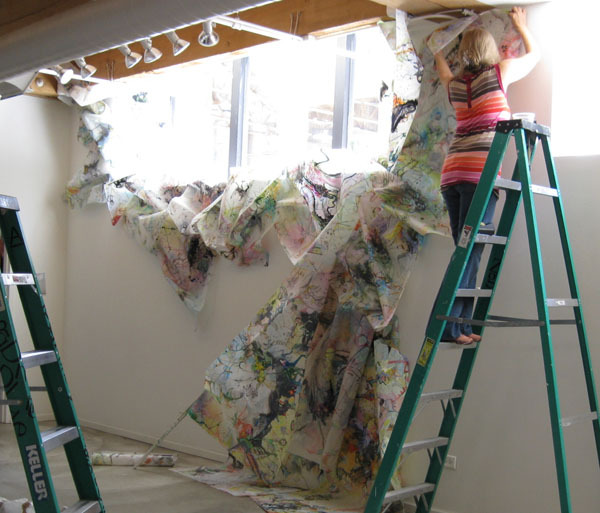 Accordion books, canvases, large and small, sticks, translucent drafting film, fabric and large site specific installations reflect restlessness, clarity and confusion. They also address the blurred boundaries between painting, drawing and sculpture. I am interested in the inner logic of emotion and how reason or logic contains emotion. The paintings of the "logic series": “flight,” “fury,” “control,” and “exploration,” are examples of work wrestling with these opposites. My work is generated in a dialogue between not knowing and knowing. When I begin, I do not know where my work will go or end up. The process is terribly frustrating, but also exhilarating when it surprises me. 2005 Individual Artist Award Nominee, The Richard H. Driehouse Foundation, Chicago. 2005 LIST #3, CIA.is - Contemporay Icelandic Art . Web Magazine. Living Art Museum Reykjavík, Iceland. Exhibition Catalogue. Museum of Contemporary Art Chicago. Summer Catalogue. 1987 I Have Feelings. Series of photographs and a Teacher’s Guide. National Center for Educational Materials of Iceland.